Interestingly the wheel sprang back to shape (visible in the video / photos after he hits the deck). Wouldn't ride on it again though... I'd expect the fiber's bond to resin to be affected. The collapsing wheel did not cause any crash, Mark Cavendish changing direction and running into Haussler did. 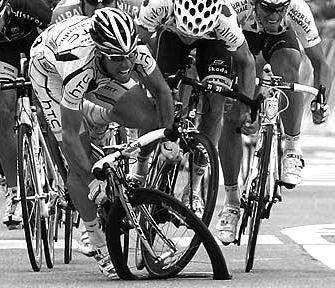 Agree with Kikomannen, looks like to me that Cavendish caused the crash. Cavendick. Drifting into other riders lines is how he wins half of his races.